We have defined mechanocoupling as the transduction of applied mechanical forces into a local mechanical signal which bone cells can perceive. Two candidates for this localized phenomenon are substrate strain or fluid flow within the bone matrix. 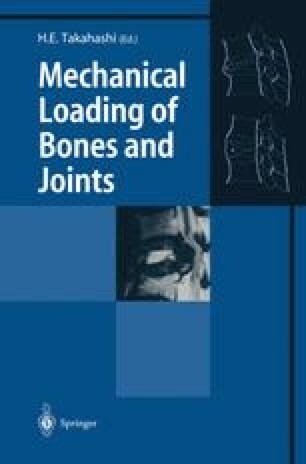 Studies using the rat tibial 4-point bending model show that dynamic loads but not static loads increase bone formation, suggesting fluid flow as the machanical determinant of bone adaptation. To study the effects of these candidates on the osteoblast, MC3T3-E1 cells were grown on type I collagen-coated plastic plates and subjected to 4-point bending. Varying levels of substrate strain and fluid effects can be created independently in this system. Osteopontin (OPN) mRNA expression was used to assess the anabolic response of MC3T3-E1 cells. When fluid flow was low, neither strain magnitude nor strain rate was correlated with OPN expression. However, a higher magnitude of fluid flow significantly increased OPN mRNA expression independent of the strain magnitude or rate. We conclude that extracellular fluid flow might be more important than deformation of cell substrate in bone formation in response to mechanical loading.